It’s like the term singer-songwriter was invented for him. He certainly was right at the beginning of the 1970’s phenomenon. There have always been artists who wrote and performed their own songs, but in the ’70’s it became a category, and JT was leading the way. We became aware of James Taylor when he recorded for Apple Records. He was the first artist signed to Apple by Peter Asher (formerly of Peter & Gordon, and in the above photo). Taylor’s self-titled album was released in late 1968. It’s most notable for two songs, “Carolina In My Mind” (Paul McCartney played bass & George Harrison sang backup) and “Something In the Way She Moves”. George liked that second title so much he used it as the basis for his own song on Abbey Road. “Something” doesn’t actually sound like JT’s song, and he was fine with it. He’s always been complimentary about his time with The Beatles, and loved watching them record The White Album. Despite the album, James Taylor, being less than a sales success, it’s a good first album. Fortunately for all of us, producer Peter Asher even came to the United States to continue working with James when he signed with Warner Brothers. Asher also produced Linda Ronstadt’s best albums. James Taylor and Peter Asher found that a little less-produced, more personal style was the answer to success. In February of 1970, Sweet Baby James was released. People were introduced to the hits “Fire and Rain”, “Country Road” and “Sweet Baby James”. Actually, “Sweet Baby James” was released as a single and didn’t even chart in the Top-40. That’s because so many people bought the album instead! Carole King played piano on Sweet Baby James, and ended up touring with him. She is one of the world’s great songwriters, and this was the time when she was becoming a performing artist. James heard one of her new songs, and got her permission to record it for his next album. 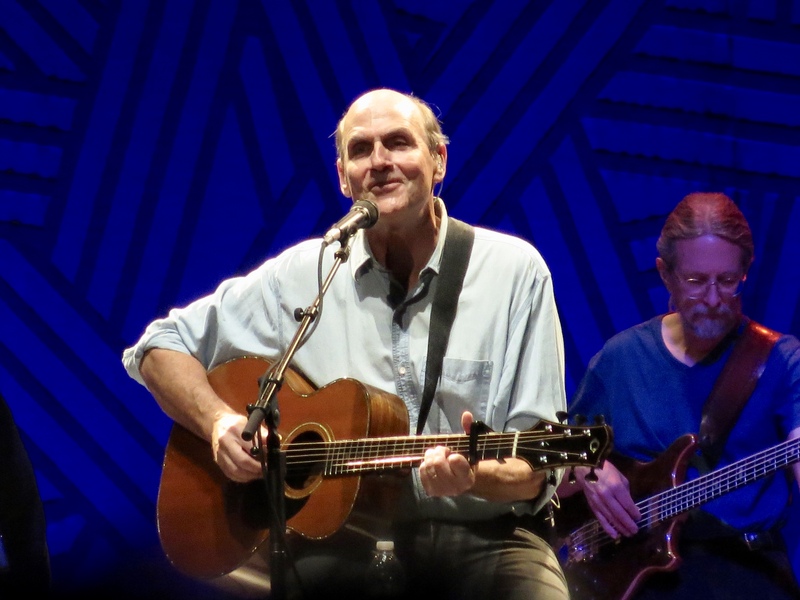 “You’ve Got A Friend” shot to #1 in mid 1971, and by then everybody knew James Taylor. The album Mud Slide Slim And The Blue Horizon also included “You Can Close Your Eyes” and “Long Ago And Far Away”. The latter featured Joni Mitchell on vocals and Carole King on piano…you’ve got friends indeed. He also has my wife as his friend…on Facebook. James (as we call him) is Jeannette’s absolute favorite artist, and we have all of his albums. He has maintained an active career, and still fills large venues, so we’ll just touch on some of the musical highlights. 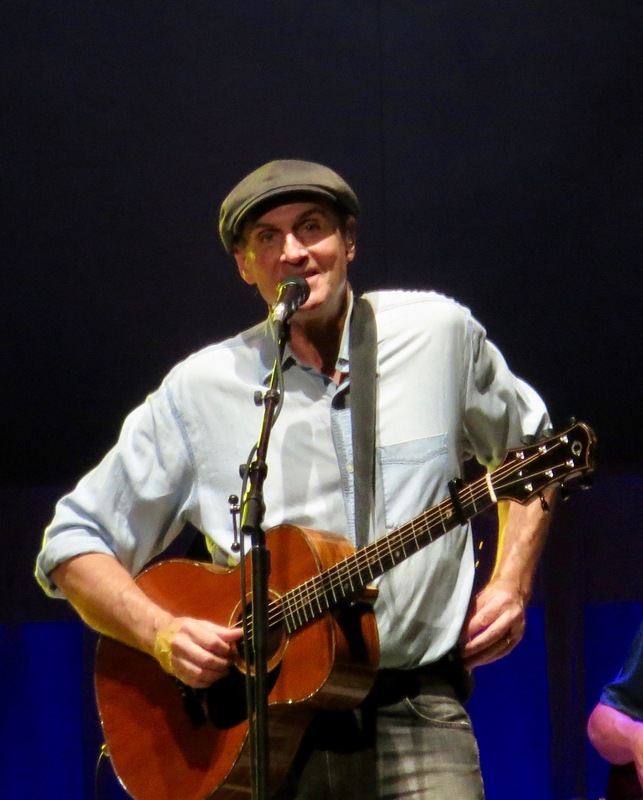 James Taylor’s next five albums are all high quality…One Man Dog, Walking Man, Gorilla, In The Pocket, and JT. Along with the first three albums, these hold the bulk of his truly classic recordings. Songs include: “Don’t Let Me Be Lonely Tonight”, “How Sweet It Is To Be Loved By You”, “Shower The People”, “Handy Man”, “The Secret O’ Life”, and “Your Smiling Face”. Those are just a sample of great songs you’ll find on those albums. Many of our favorites are album cuts rather than singles. Of his later albums, New Moon Shine and Hourglass stand out. 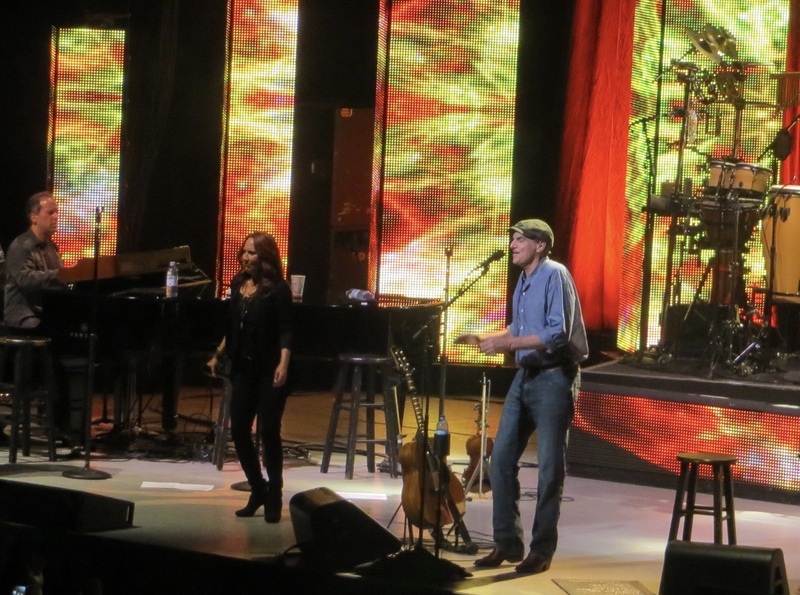 Attending a James Taylor concert is always special. His voice, even now, is a rich baritone, his style is down-home casual, and it’s obvious how much he loves music and performing. You’re wrapped in a warm & friendly place. We’ve been attending his concerts for decades. At one of the earlier concerts, we were in the 5th row center (before scalpers). James came out with just his acoustic guitar and impressively performed some of his songs for us. As he went into one of my wife’s favorites “Wandering” we said to each other that the song needed the beautiful harmony. As he hit that part of the song, the lights went on behind a black see-through curtain, and his back-up singers and band turned it into magic! The above photo is from when we saw him in Portland in 2014 (tickets thanks to our friends at the Bicoastal radio stations here in Eugene). Last year he came to our town (2016 photo below). He can still touch people with his songs, like when he ended the concert with one of his newest ones “You And I Again”. 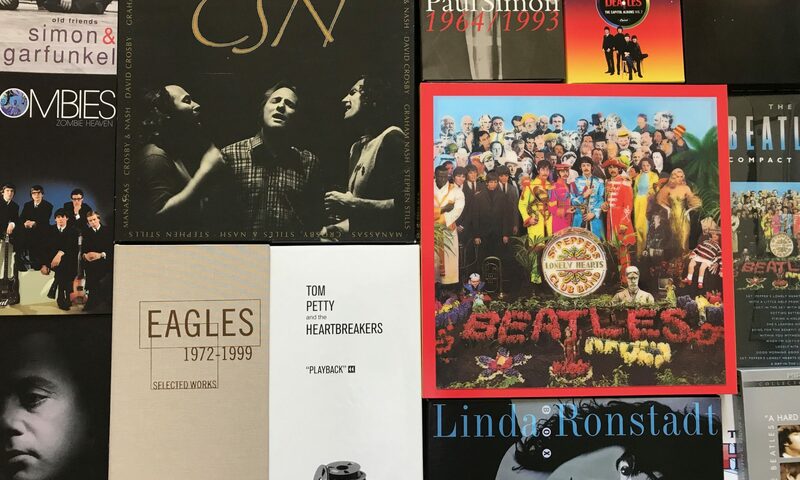 The singer-songwriter movement in the ’70’s brought us some of the best songs of our lives. It’s amazing how well those recordings hold up, and it’s satisfying to see James Taylor loves his work. I just caught up with reading all the articles and I thoroughly enjoyed them. The music produced during those decades is timeless, and I will always enjoy listening. I first really started to appreciate music at the age of 13, and used to play my radio almost 24/7. I agree with Jeannette, James Taylor is amazing. I hope I get the opportunity to see him live. I wanted to add also, you mentioned Paul McCartney played bass for Carolina on my mInd. I do enjoy him as well, and my first ever vinyl record was an album by Paul McCartney and The Wings – I really don’t recall the name of the album, but I do recall my favorite song was (and still is) Band on the Run. Did Paul ever do any other work as Paul McCartney and the Wings? Note: Susan and I had a conversation about Paul McCartney’s solo career, with and without Wings. Thanks for your comments Susan!